Let’s take a look at the chart of the mass murderer Stephen Paddock, the Las Vegas shooter who killed 58 people. This is, certainly, one of the most afflicted charts I’ve ever seen having worked for decades as a professional astrologer. 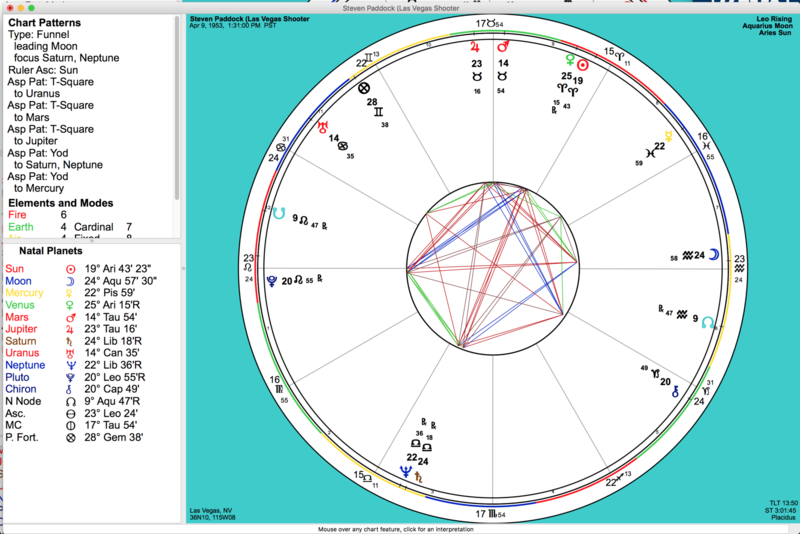 There’s an evil potential in Paddock’s chart — a T-cross of Moon/Mars/Pluto, Saturn opposing Sun/Venus, squaring Uranus in a T-cross and afflicting Jupiter by a quincunx aspect. Before I embark on this astrological interpretation, it is important to comment on references to specific aspects that may occur in the charts of those who read this article and who, invariably, will feel alarmed and concerned that this interpretation describes them in some manner or another. Astrology aspects in a chart are a collective whole that gives a concise picture of a person’s soul and spirit. My nose on my face may be proportionally perfect for the rest of my features, but placed on another it would give an appearance of disfigurement as the rest of the face does not fit the placement of my nose on their features. Similarly, astrological aspects, taken as a whole, can describe certain characteristics that would fit that chart and that person, as a whole, but they might not be as significant and meaningful in another person’s chart when a total view is taken. It’s the preponderance of evidence that leads to a conclusion in astrology. I follow a scripture that says, “Except there be two or three witnesses it cannot be established in law. In the mouth of two or three witnesses shall every word be established.“ (2 Corinthians 13:1) I use this rule in my astrological work whether it is in the interpretation of a chart or predicting events in the life of my clients. To begin this discussion, it should be noted that Venus, Mercury, and Mars are all in their detriment in Paddock’s chart, meaning they are in signs opposite to what they rule, making them potentially more injurious and subject to malicious expression. Now, if all of the above wasn’t enough, Paddock has a YOD, (THE FINGER OF GOD) formed with his Saturn/Neptune conjunction to Jupiter and Mercury, plus, as mentioned above, Saturn is opposed to his Sun/Venus. You will often find the YOD formed in charts at the time of a person’s death being triggered by transit Saturn, New Moon, or Progressed Moon. After spending years of work in this field, I have found and developed a technique that worked for me – three simple calculations, which went against almost all modern astrological teachings, discovered in great detail in my recently published book The Cosmic Key to Astrological Prediction: Astrology It’s dead serious These three, when aligned in agreement in a chart, have proven to be infallible in their predictability. It’s akin to the hour, minute and second hand of a clock. Their alignment tells us the accurate timing of events in our life. Why Feature Death to Prove My Thesis? Having worked as the radio producer and presenter for over 30 years hosting syndicated astrological and metaphysical radio shows on KIEV, KEST, KFOX, and WROL I found time is of the essence in accessing birth information and seeing forward and backwards in time in my clients’ chart. I will take you on a journey of my discovery, the discovery of The Cosmic Key to prediction that will have simply three rules for prophetic reading of events in a chart. I will be using charts of recorded events in history that are quite tragic and irrefutable as the events they portray. There’s nothing more final and more defining than death, and these charts will show the power of The Cosmic Key technique to predict such a calamitous event with uncanny accuracy. I chose these charts and these events not only because they are officially recorded – but are undeniable in their impact. I could have used events such as the purchase of a new car, new home; a new job, a marriage, but the examples I chose are the most dramatic, irrefutable, and defining of the power of The Cosmic Key. Utilizing The Cosmic Key method of prediction there are certainly three witnesses to this event. The New Moon preceding the shooting massacre in Las Vegas occurred at 27º Virgo and set off an opposition to Mercury and a YOD to his Venus/Sun conjunction and to the Moon at 22º Aquarius. Transit Saturn formed a quincunx to Jupiter setting off Paddock’s natal Jupiter/Mars conjunction and also squared his natal Mercury. It also made a very favorable grand trine to the murderer’s Sun/Venus conjunction and Pluto in his natal chart, allowing him to achieve this life (Sun)-taking enterprise and death dealing (Pluto). His Progressed Moon was sitting right on top of Uranus (surprise and unexpected) at 12º Cancer setting off the square to his Sun (life). I’ve been teaching for years that the most dangerous aspect in a chart are afflictions between Mars, Saturn, and Pluto, and in men’s charts this often creates a person who is controlling (Saturn), and Mars (angry) and potentially lethal (Pluto). The Saturn/Mars affliction creates a tendency to hold on to hurts with an unforgiving heart. It often is accompanied by depression (Saturn) and anger (Mars). It can bring a person great strength if utilized correctly. In a woman’s chart, these aspects often brings abuse at the hands of others, be it a parent or a mate. All of these aspects point to a person who is potentially psychopathic, unfeeling, self-obsessed, and very dangerous — Stephen Paddock, the man responsible for the deadliest mass shooting in modern US history.